This photo was taken somewhere in Europe, and I can’t believe I never saw it before – specially since the author behind it is one and only Julian Beever, master of 3D pavement art. What you see below is a street and a plain stone bench occupied by an ordinary citizen and one unordinary creature. 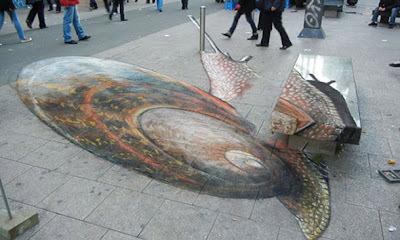 Both pavement and bench are partially covered by a chalk drawing. The drawing disappears in places, and at one point seems to bump into a metal pole. 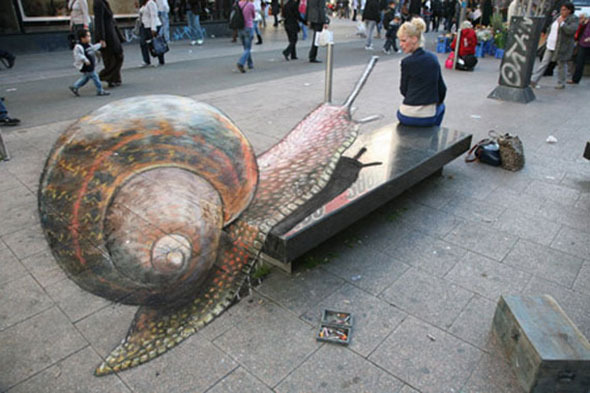 What I find so interesting about this anamorphic painting is it’s seamless transition between flat pavement surface and a bench. But I guess this all makes sense when you see it from another angle. Both photos are included!